This week, I'll be posting more information on South Middleborough and its history. "Think of the fun we'll have"! Postcards such as this were standard issue throughout the early 1900s. Printed in massive quantities with no particular identifying photograph, they were sold in bulk to businesses which could have their community name printed on the front. 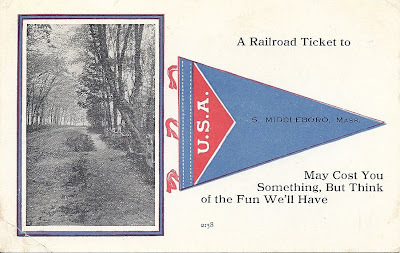 Its likely that this card was ordered for sale through the South Middleborough store at a time when it was operated by either Robert McLeod or Thomas Brothers.